Anyone who's been to one of these things before: are they worth it? And more to the point, how long will the SRK line be? Aspi, Abby, Nida, shall we block it off on our calendars? OMG, yaar!! 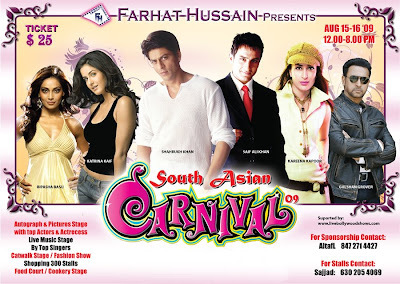 I will go to this with you if it means I get to do cheezy photo ops with SRK and Saifu! I am more intrigued by how long the line for Gulshan Grover is going to be. Yes!! !Let's do it--and cross our fingers that everyone on the poster will actually be there this time. ..But doesn't the $25 price seem a bit sketchy? The website says that our fav stars will just be doing a meet & greet, and with 50,000 people going you may spend most of your time standing in a line, altough I would stand in line for days just to get a glimpse of SRK! If I could hop and plane I'd meet all of you down there! That being said, it will probably be an amazing time just absorbing all the culture in. I wish I lived nearby. I'll go sulk in a corner now. EVERYBODY should come! That would make waiting in line much more enjoyable. I will totally get pictures of Gulshan Grover. After the Unforgettable event last year, I decided that there were probably only a few people I would pay more than about $40 to see, and of course SRK is one of them. But I had been thinking of a proper stage show, not some...whatever this is. But I'll probably go. I'm with Memsaab - surely the shopping will be fun at least? Pankaj - Thanks for the link! I'll start working on my supernatural powers now. Oh my goodness, it's in Houston too. I'm with everybody else-- would stand in line for days to meet SRK. Days. But I am weirded out by the terrible website ("Asina" is what it says instead of Asian on the browser title, for example). I'd be so nervous to actually meet any of the celebrities at the autograph table that I'd probably throw up or pass out, or both.